Mark Twain once said that history doesn’t repeat itself, but it does rhyme. If Twilio provides any indication of what’s to come, we believe now more than ever in the future of the business-to-developer (B2D) space. As we reflect on 2016, Twilio’s IPO is a brightspot. 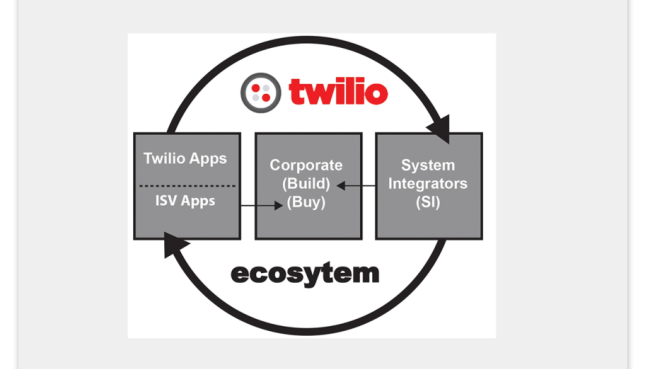 When we originally published “Eight laws for developer platforms,” we delved into our early memos recommending an investment in Twilio; then, and now, the company continues to exemplify these laws in practice. With permission from Twilio, we’re open sourcing an inside look at our original investment memos, which Byron Deeter, David Cowan, and I co-authored. We diligence each company before investing and compile our findings into an investment recommendation that forms the basis for our internal discussions and consideration. Interestingly, we can clearly pattern match Twilio to almost all of our Eight Laws. Not unlike SaaS businesses, successful developer platforms need to deliver predictable, recurring revenue — ideally that expands on a customer basis over time. Twilio charges by the call, phone number or text message, and this pricing schema has been core to Twilio’s 155 percent dollar-based net expansion rate (from their Q3 2016 10-Q). This law runs in parallel with the first. Developer businesses sometimes mirror consumer businesses in that an initially free or cheap product becomes so valuable that developers are later willing to pay for it. Consider the number of companies that rely on AWS. Amazon allows customers to provision EC2 instances for as little as several dollars a month and scale as usage (and dependency!) grows to some very large numbers. In 2017, AWS does more more than $13 billion a year in revenue with 60 percent year-over-year growth; a large part of this growth comes from existing businesses. Developer platforms need to be so mission critical and such a step function improvement over the status quo that customers don’t mind paying up as their business succeeds. The truth is that as Twilio has grown, the network effect has become more prominent, given the large number of developers with active accounts (34,457 as of the company’s Q3 2016 10-Q — active account defined as spending at least $5 in the most recent month). The more developers trained on how to use Twilio, the more likely an enterprise or Independent Software Vendor will turn to Twilio to build a particular piece of functionality. Developer platforms that enable and empower non-developers are truly a needle in a haystack — but extremely powerful once the core mechanics are working. As we note below, we loved that some of Twilio’s earliest customers were from ordinarily non-tech-enabled organizations, such as the DNC and RNC. Twilio enabled them to power voter outreach, which felt especially prescient given the election around the corner (by which we meant the 2010 midterm election) and how candidates were trying to capture constituents on their platforms of choice (e.g. on mobile). Twilio was Bessemer’s first investment in the business-to-developer space, and the first pure B2D API company to go public. It has been a pleasure to get both a backstage pass and front-row seat to Twilio’s success from a seed investment to an extremely successful company by any measure. Working so closely with Jeff Lawson and Twilio’s team over the years is not an honor we take lightly. We are excited for the future of developer platforms, particularly the role they will play in transforming traditionally non-tech-enabled industries into the modern framework of web development. We feel strongly that Twilio’s success in enabling developers to build creative and engaging applications in an area with clunky, inefficient alternatives — e.g. communications — is a trend we are going to see more and more of in the future.